The Radiance™ Laser combines the advantages of Fiber and YAG laser technologies with our latest 4900 Automated Programming System. As programmable component volume accelerates and quality processes demand traceability, the industry needs a laser marking solution that is easy to use and delivers quality results, every time. Shrinking package sizes and range of materials require a safe, reliable system that produces human and machine-readable marks. Micro-marking information in a limited space requires ultra-fine marking capability, beyond that of conventional laser marking systems. The Raydiance™ utilizes fine control for shallow marking, producing a vivid contrast with a low thermal impact, preventing semiconductor damage. 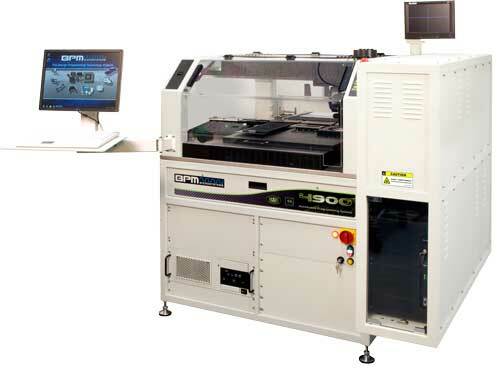 BPM Microsystems’ Automated Tray Stacking System automatically loads and unloads JEDEC trays for BPM Microsystems’ 3000 and 4000 Series Automated Programming Systems. Equipped with the capability of transferring up to 24 trays of IC devices before reloading, the TS-1500 can significantly reduce operator intervention and provide a continuous programming operation. Mistakes of passing blank part trays are avoided by the unit’s separate input and output tray stacks. 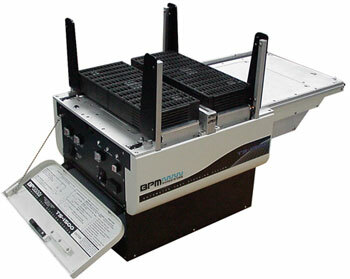 The TS-1500 Automated Tray Stacking System reduces your labor costs for programming IC devices. 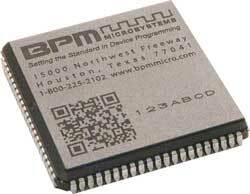 BPM Microsystems has developed a solution for small parts fed from tubes to the automated programming systems. The Single Lane Tube Feeder/Loader addresses the consistent feeding and reloading of small package parts. Tooling for the Single Lane Tube Feeder/Loader is currently available for 8-pin SOIC, TSSOP, MSOP, and 6 pin TSOC devices. The feeder/loader uses specific interchangeable tooling for each package size. 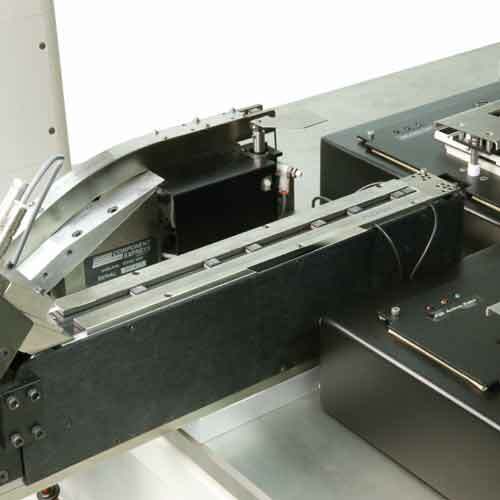 Multiple base units of this ultra-compact automated programming system peripheral can be mounted on one machine for expanded handling potential. The Single Lane Tube Feeder/Loader can fit six feeder/loader bases in a 5-inch area (12.7 cm). Each APS input is capable of holding two bases for a total of 12 feeder/loader combinations. BPM Microsystems supports the Single Lane Tube Feeder/Loader on its 3000 series and 4000 series automated programming systems. A wide range of devices is distributed via tubes. The main method for programming devices in tubes has been gravity-feed or vibratory-feed. Each of these methods is labor-intensive and prone to errors. Given this information, users must either spend valuable time transferring parts from tubes to trays or constantly monitor jobs while they run. Only tube-based part delivery method that makes your operation more efficient and saves you money. Unlike vibratory feeders, it is reliable, non-stop, easy to use, and requires less operator intervention. Reliable part delivery is the most important feature of the Tube Stacker. The system delivers all parts repeatable to the same pick point via the part conveyor. This means that you will not need to make adjustments during the job, and the machine requires very little operator intervention. True “Non-Stop” operation allows you to load additional tubes while the job is running without stopping the handler. This means that you can load tubes when the machine is empty, or when it is partially filled. This also means that you can spend more time away from the machine performing other tasks. Quick and easy changeovers are an important feature of the Tube Stacker. Special compression handles are used for fast release and replacement. This means you can switch between package styles and maintain a high level of utilization.